The UK’s first Dota 2 Major went to Virtus.pro, who won their fifth Dota 2 Pro Circuit (DPC) tournament. They ran over OpTic Gaming in the Grand Finals and went unbeaten in all ten games they played at the tournament. Vladimir “No[o]ne“ Minenko became the first core player to win the MVP Mercedes Benz at an ESL Dota 2 event this year, making this is the third time in a row the MVP prize has been awarded to a Virtus.pro player. Evil Geniuses announced a major roster change, with Clinton “Fear” Loomis and Rasmus “MiSeRy” Filipsen leaving the team to make way for Gustav “s4” Magnusson and Tal “Fly” Aizik. The latter two players transferred from OG. Following this roster announcement, OG withdrew from the China Dota 2 Supermajor. They were replaced by OpTic Gaming. Jimmy “DeMon” Ho released a vlog this week declaring his intention to stop pursuing a career as a Dota 2 professional player. Demon’s been on over twenty teams in a career spanning more than seven years. He had the most success with TNC Gaming in 2016, finishing in the top eight at The International 6. His announcement this week included reflections on his time with the Filipino team and his difficulties with his most recent team, Team Admiral. He expressed an interest in continuing to stream, with the potential for casting and analytic work. “Classic Jimmy” may have signed off of professional play, but it’s clear he won’t be leaving the scene any time soon. The last event in the DPC, the China Dota 2 Supermajor runs from June 2-9th in Shanghai, China. Sixteen teams are competing for 2250 DPC points and a (US)$1,500,000 prize pool. The event features a GSL-style group stage that seeds teams into a double-elimination playoff bracket. 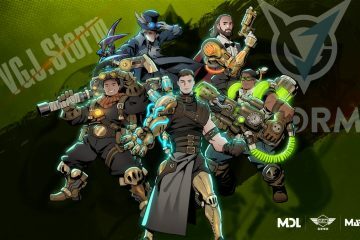 Playing up its position as the final tournament in the season, the Supermajor has embraced a superhero theme, including releasing announcements with superhero graphics and a series of comics depicting iconic Dota 2 moments all through the Perfect World Twitter account. Catch all the China Dota 2 Supermajor action on twitch.tv/pgl_dota2, twitch.tv/pgl_dota2en2, twitch.tv/pgl_dota2en3, and twitch.tv/pgl_dota2en4.